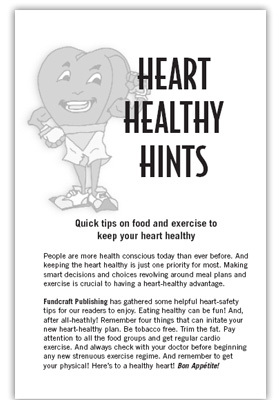 Another FREE option to enhance your cookbook is our 16-page Healthy Cooking Hints section. These pages of nutritional information will be placed at the back of your cookbook just after the recipe index. 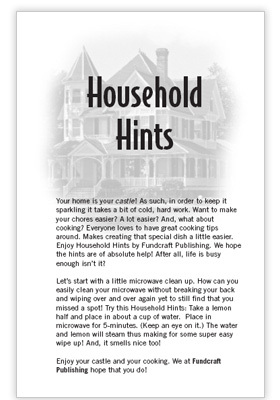 These useful information and easy-to-read format is a great complement to the hints that appear on the backs of our divider sets, and will help your cookbook sell. Many of the hints are illustrated, depicting a number of meal preparation subjects. If you prefer, this section may be omitted by indicating on your order form. Many times a group wants to add pages to their cookbook or make a statement to their customers. 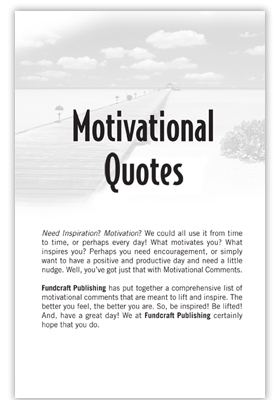 Fundcraft has developed four (4) different and unique 16-page inserts that can be placed at the back of your books for a small additional charge. 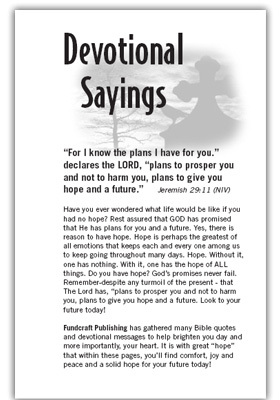 The sections are information on (a) Household Hints, (b) Motivational Quotes, (c) Heart Healthy Hints, or (d) Devotional Sayings. Each section has been professionally written and will add to your cookbook value.